Little did I know when I picked up a book on whittling, that it would lead to an obsession that has lasted for more than 50 years. 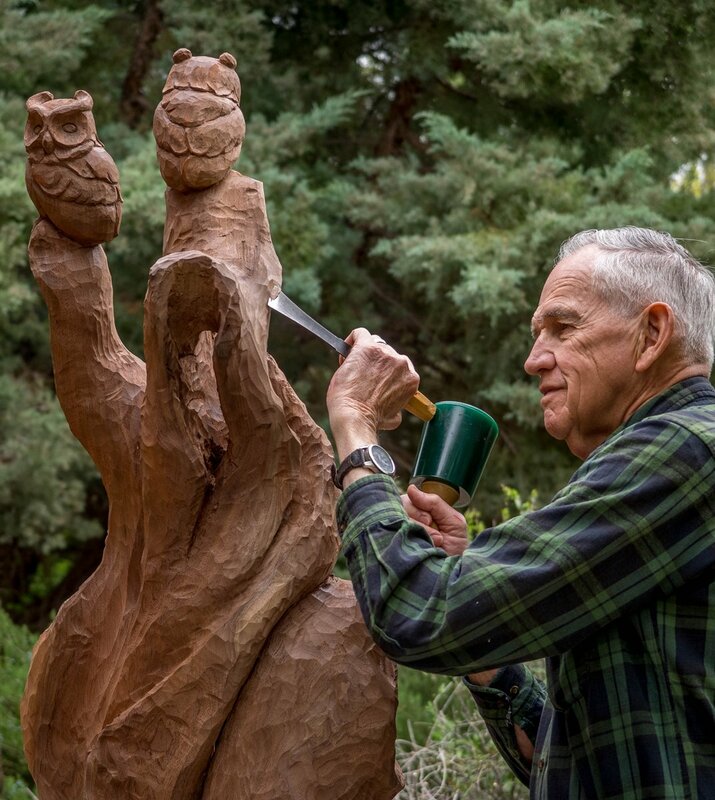 What started with a pocket knife and a few scraps of wood grew into a hobby that extended through a 30 year career with the National Park Service. That hobby has since become a full-time retirement occupation. Over the years, I have worked through styles ranging from caricatures through fully painted, highly detailed bird carvings. Throughout the years of self-study and experimentation, I found myself drawn to a simplified style which captures the key form and behavioral characteristics of the subject. My work today often flows directly from my many years of observing and working with wildlife in their natural settings. Drawing upon these experiences, I attempt to blend the smooth curves and subtle lines of the natural world with the unique characteristics of the hardwoods that I prefer to carve. Typically, a piece progresses from personal observation and research through a quick clay “sketch”. I then move on to tools which commonly begin with traditional chisels and mallet. As work progresses tools may include anything from dental tools to power grinders and a chainsaw. The challenges of researching a new piece, finding the right material to match the concept, and following through to a finished piece are what drive me. Capturing the essence of a subject drawn from nature to create a unique, one-of-a-kind wood sculpture is something of which I have never tired.